As someone who really enjoys eating out and getting her atmosphere on at restaurants and bars, planning dining adventures with a baby in tow has been an adjustment. No longer am I running to check out hip places after dark. If it’s new and trendy, I automatically consider it a no-baby zone. Others may feel differently, but I assume most places don’t have the space or the patience to deal with the “baggage” that comes with new parents and their newborns. Yes, for the moment I care what others think, and I’m not comfortable with the chance of LG making a scene in a tight spot. I used to wait tables and have an over-the-top sensitivity to those in the industry. The keys to dining success with a newborn are ample space at and around the table and giving some f***s about your neighboring eaters. Don’t be this family. Step 1. If you’re planning on going to a bar/restaurant with baby, call to confirm they allow those under 21 in the door. This sounds ridiculous, but some bars that serve food are perfectly fine with you and your baby hitting them up for a quick meal. Some, on the other hand, will not let you and baby past go. We learned this the hard way at a taco joint here in San Diego. We planned on eating on the attractive upstairs deck of South Beach Bar and Grill, but we were turned away at the staircase because we all had to be over 21. I understand this rule if it’s 12:01 a.m. on a Sunday. But at 12:01 p.m. Saturday afternoon this seems a bit silly. We stayed and ate downstairs and it was a pretty miserable experience (that had nothing to do with LG). Downstairs was dark and grungy and the supposedly must-try tacos made me cringe then and I’m cringing now. Step 2. Pack the diaper bag with an emergency bottle (or cover-ups if you’re breastfeeding). I have no qualms breastfeeding in public. OK, I have a few qualms. I admit LG and I are way better at home with our nursing pillow. He’s easily distracted and doesn’t eat very well under the curtain. I have fed him in public spaces and/or in the back of my car, but I do feel awkward whipping it out at restaurants in the close vicinity of other diners. And so as not to make others feel uncomfortable, I prefer to bottle feed if needed at a restaurant. 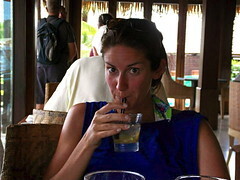 So far we’ve been able to soothe fussiness with motion, but if it ever got really bad the bottle would be the way to go. Step 3. It’s all about the space. The bigger, the better. Chains are our new best friends: Chili’s, Islands, Cheesecake Factory, IHOP, Joe’s Crab Shack, etc. I used to scoff at chain-dining. Until I moved to South Carolina. Then it was almost all we had in our little town. And now with LG, the chains are most appealing because they have the space to accommodate us with a carseat and/or stroller and they’re usually loud enough that if LG squeals at all, nobody hears him. Restaurants with booths are great because you can typically squeeze the carseat in next to you. Space around the table is helpful too because whenever LG gets fussy, one of us hops up with him, carseat on our elbow and we bop around with him until he dozes off. We’ve been really lucky with welcoming, friendly staff with LG on our arms. I can think of only one circumstance where I got the stink-eye from a couple in Carmel, of all places, for rocking around with LG. If I receive unnecessary stink-eye, I send it right back. Step 4. Off-peak hours are easier on everyone. Gone are the days of eating breakfast or brunch at 11 a.m. and dinner at seven. If we plan on getting some eggs on the weekends, we’re up and out by nine. And if we’re in the mood for a fun dinner, the wait staff has barely finished folding the napkins for dinner service and we’re walking through the door. This is in part a preventative measure (like the less people around the better in case something were to go wrong) and in part due to LG’s 7ish bedtime. Step 5. 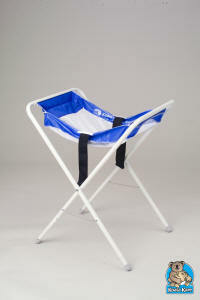 Ask if they have the nifty carseat sling (see pic below). I’ve seen some people flip highchairs upside down and place their carseats in them, but it seems a little flimsy. I wish more restaurants offered the slings. We’ve really been big carseat carriers. We rarely bust in anywhere with the full stroller apparatus. LG is getting pretty big so the carseat-lugging days are soon coming to an end. MainMan and I still alternate bee-bopping LG in the carseat with the hopes he’ll snooze long enough for us to take turns shoveling food into our mouths. I’ve never eaten so quickly in my life. Step 6. Stick to one course. And make a note to your server that you have a ticking time bomb on your hands. MainMan often uses the saying, “He’s gonna turn into a pumpkin any minute now!” I might add a screaming, flailing one. If your server is smart, they’ll be monitoring the situation and ready to drop the bill at a moment’s notice. Lucky for us we haven’t had any really dramatic episodes while out to eat. We go into it realizing it’s not going to be necessarily a relaxing affair, but it will be a fun adventure. We just anticipate one of us will be standing up moving and shaking LG to keep him from having his “I’m bored and not moving” fit. To our surprise, LG seems to have become more chill in the carseat at the table. The past two times we’ve eaten out we were able to successfully rest him on a chair with only light interaction and MainMan and I both ate at the same time. The little victories! Pretty soon we’ll be putting him in a highchair, which is equal parts exciting and terrifying. Now that he’s eating solids I imagine we’ll start bringing along food for him to eat with us. A former co-worker and friend from ABC commented on a post a while back: “Go out a lot. When he starts walking, it’s a whole different ballgame!” I appreciate her advice and have been witness to other parents experiencing this next phase. I envision it going something like this: me eating a raw bar tower and sipping a dirty martini while watching MainMan doing laps around me chasing after our little BIG guy walking. Thanks for this advice for going out to eat with a baby. It’s good to know to look for places with big enough space to accommodate. This seems really important to make sure you have enough room without disturbing the other customers.